1 oz. 2 oz. 4 oz. 1 lb. 33 lb. 50 lb. $1.99 to $259.99 & FREE Shipping on orders over $59 $35. Add the “aged in oak” flavor to your wine without the oak barrel! 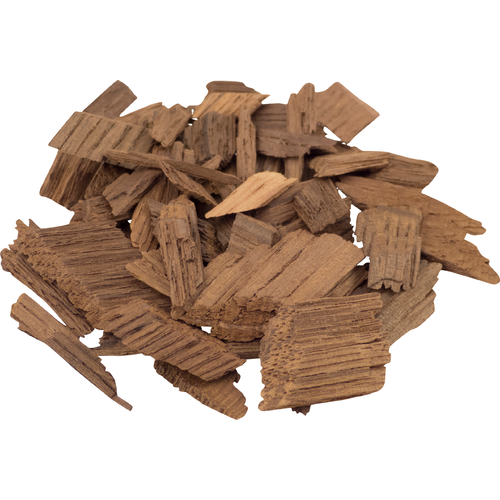 Our high quality, yet inexpensive French oak chips come from a local cooper in Napa, California. Medium Toast. I'm adding to an Oatmeal Stout that I am keg conditioning. Hoping to help color stabilization, etc. during fermentation. Not really going for heavy "oaky" effect on finished wine. I have my porter in the secondary fermenter together with the oak chips which I soaked in portwine for 2-3weeks. My beer is now in contact for 2 weeks with this chips but I can't taste any oak or portwine flavour. I have 3gal of porter and 1.5oz of soaked chips (french oak medium) in the secondary. I'm a bit confused that I can't taste any flavour at all. Will this take much longer than expected, let's say 3-4months? I did read up on this topic but got different inputs, some sources say a few days or max 1-2 weeks, other sources mention 3-4 months. Just curious if I should soak and add some chips again or just wait a few weeks/months and taste once a week or so. Any input is highly appreciated. BEST ANSWER: Hello Jan - I don't think it would hurt to add more soaked chips. It should not take 3-4 months to transfer flavors this way. I have bought and used these for different recipes. I prefer my whiskey in oak. I guess I haven't made a real connection with oak in ale yet. That being said their wasn't a bunch of fines in this. It was perfect for the recipes I was using.